Barcelona offers a large number of tourist attractions and cultural sights. It is impossible to cover all this offer in a visit of just a few days, so we have compiled the top ten places you should not miss if you visit the Catalan capital. Antoni Gaudí, The Sagrada Familia, Barcelona. Gaudí’s masterpiece and prime example of Catalan modernism, the Sagrada Familia (Church of the Holy Family) is the most popular sight in Barcelona. This large basilica is striking not only because of its whimsical shapes, but also because it is still under construction. 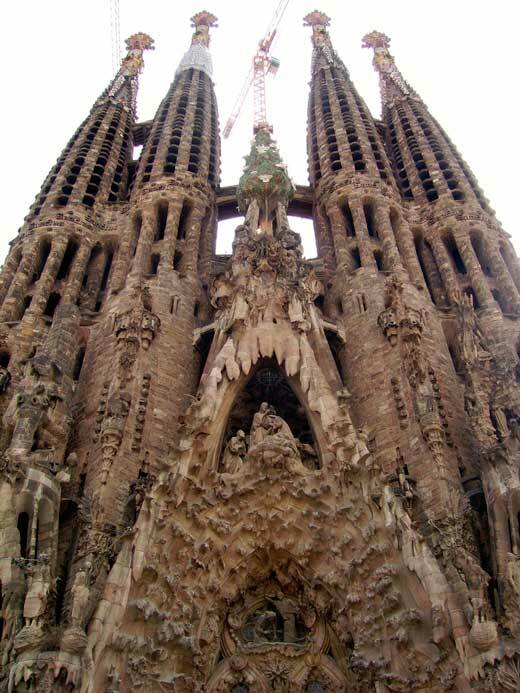 The first stone of the Sagrada Familia –a church which occupies a whole block in the Ensanche– was laid in the year 1882. Construction started one year later under architect Francisco de Paula del Villar y Lozano, who had planned a building in Neo-Gothic style. Due to some disagreements with the promoter of the project, bookseller Josep Maria Bocabella, and the architect who advised him, Joan Martorell, Francisco de Paula abandoned the project soon after starting it. 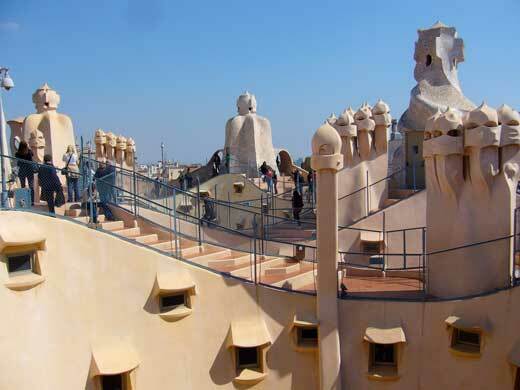 It was then that Gaudí, a 31-year-old architect who had worked as an assistant to both Francisco de Paula and Joan Martorell, took over the project. He devoted the rest of his life to it, at first in parallel with other works, but in his last years in an exclusive manner: given that Gaudí worked with sketches and took many of his decisions on the go as the works advanced, his presence on the construction site was indispensable. As soon as he was put in charge, the first thing Gaudí did was to change completely all that had been planned. He designed a totally different building (except for the crypt, which had already been built), in which the most important elements are the 18 towers that rise high with a parabolic profile. Once the building is completed, it will have four towers above each of its three façades (a total of twelve towers representing the Apostles), two large central dome-towers dedicated to Jesus and the Virgin, and four other towers (the Evangelists) surrounding them. As can be seen, symbols play an important role in the design of the building. 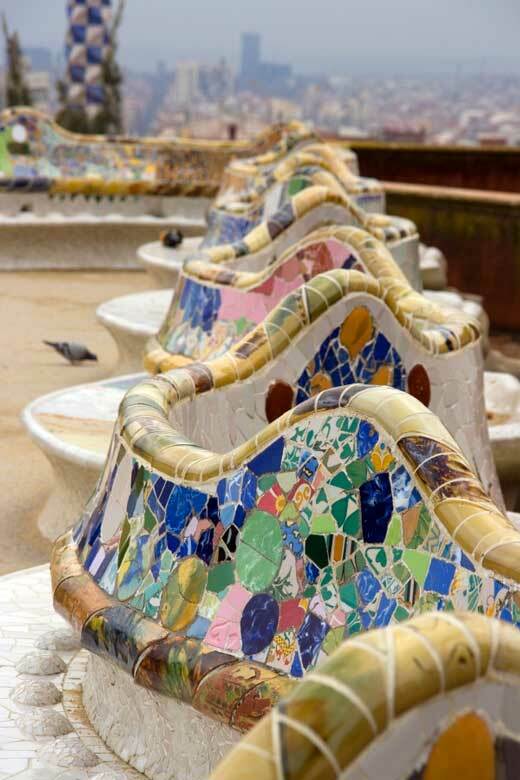 Other remarkable features are the naturalistic shapes that Gaudí employed, as well as the parabolic arches. Both are very frequent elements in his buildings. During Gaudí’s lifetime, only the Nativity façade was completed. The architect, aware that the construction would last several decades, decided to leave a series of models and sketches so that future generations could continue with the works following the original plan. However, during the Civil War a fire razed the crypt –which Gaudí had used as a workshop– and destroyed a large part of the material. After the fire, some fragments of the models could be retrieved, and, with the help of some photographs of them, new models were created with which the works could continue. Lluís Domènec i Montaner, The Hospital de la Santa Creu i Sant Pau, 1902-1930, Barcelona. 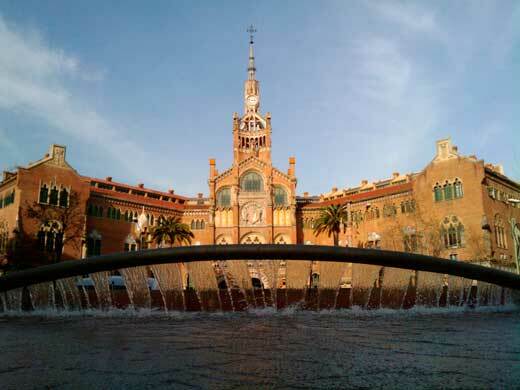 The Hospital de la Santa Creu y de Sant Pau (Hospital of the Holy Cross and Saint Paul) is one of the largest complexes in Catalan modernist architecture. It was built between 1902 and 1930 following the design of architect Lluís Domènec i Montaner, and thanks to a donation made by banker Pau Gil i Serra. The hospital complex takes up several blocks in the Ensanche and consists of 27 buildings. The design of the hospital was influenced by the hygienist theories and the technological advances of the epoch, making it one of the most modern hospitals of its time. It is divided into a series of isolated pavilions, interconnected by underground tunnels and surrounded by gardens and open spaces. This allowed the separation of patients by specialties as well as the passage of light and fresh air. The ornamentation of the buildings also plays an important role. Park Güell offers the perfect surroundings to enjoy some modernist architecture and a pleasant stroll through the park at the same time. Designed by Gaudí under the patronage of entrepreneur Eusebi Güell, it was meant initially to be a housing development for Barcelona’s bourgeoisie. In the height of Barcelona’s urban growth and construction under Plan Cerdà, Güell wanted to provide the city with a British-style residential park (hence its English name). He chose to build the park on the Montaña Pelada, a hill with unbeatable views over the sea and the plain. The space was divided into 60 plots, and paths, stairs and walkways were built. Strict construction rules were established: the buildings should not take up more than one sixth of each plot, they could not be very high and they should not block the neighbors’ views and light. Construction started in the year 1900 and, apart from the paths and walkways, a big porticoed square, the pavilions at the entry, the outer fence and the main stairway were built. However, the project was abandoned in 1914 due to the lack of buyers. During Güell’s lifetime the park, although still his private property, was used for public events; after his death, the municipality purchased it, and what was originally meant to be a residential area was converted into a public park. Antoni Gaudí, Casa Milà (La Pedrera), 1906, Barcelona. Casa Milà, popularly known as “La pedrera” (“The Quarry”) because of its stone façade resembling a quarry, is one of Gaudí’s most famous buildings. It was commissioned in 1906 by businessman Pere Milà i Camps and his wife Roser Segimon i Artells. Their idea was to build a private house for themselves and, at the same time, to have some apartments for rent in the most rapidly growing urban area at the time in Barcelona, the Ensanche. The house was designed as two independent blocks with separate accesses, but communicated by inner courtyards. The innovating construction method, based on the use of pillars, allowed the creation of wide open spaces and numerous openings on the façade. Other remarkable elements are the movement of the façade, with its sinuous lines, and the naturalistic decorations. Of all Gaudí’s works, Casa Batlló is probably the most fanciful one, and the one that impresses most with its play of shapes and colors. Despite appearances, the house was not built from scratch: it is a remodel of a previous mansion that stood on number 43, Passeig de Gràcia. The mansion, built in 1877, was purchased in 1903 by Josep Batlló, an important businessman in the textile industry. 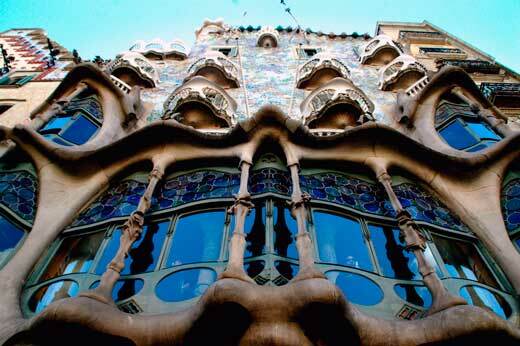 Wishing to have a house that was unlike any other house, he commissioned Gaudí to refurbish the mansion completely. After a thorough renovation of the building between 1904 and 1906, the result was a house full of bright colors and organic shapes. The roof looks like the back of a dragon covered in scales, which together with the cross on top of the turret, seems to allude to the legend of Saint George, patron saint of Barcelona. 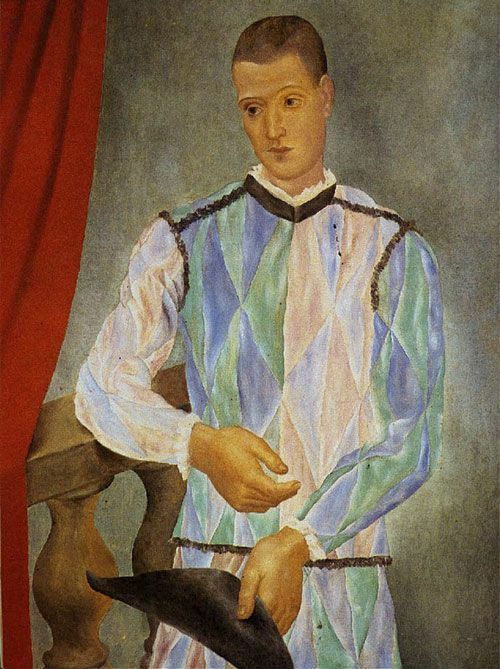 Pablo Picasso, Arlequín, Picasso Museum of Barcelona, 1917. Opened to the public in 1963, the Picasso Museum houses early works by the Spanish artist which show not only his evolution at the beginning of his career, but also his links with the city. 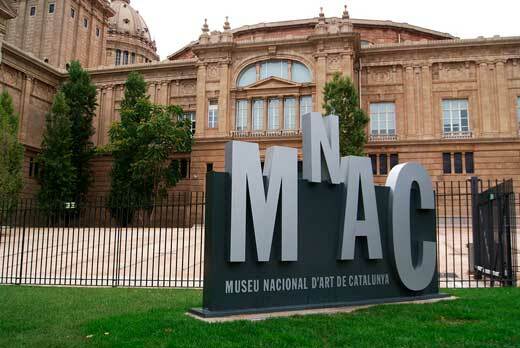 The 4,249 works comprised in the collection make this a world-class museum and a must for any visitor to Barcelona. The Museu Nacional d’Art de Catalunya is one of the most important art museums in Catalonia. Located at the top of Montjuic hill, in a building built for the 1929 International Exposition, it houses wide collections that span from the Romanesque to the 20th century. However, the most relevant part is the Romanesque collection, not only because of the quantity and quality of the exhibits, but also because of the way they are arranged. The Church of Santa María del Mar, Barcelona. 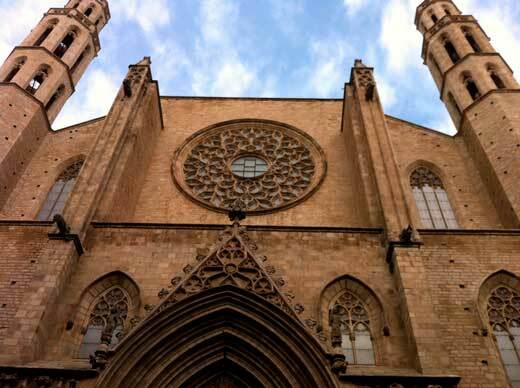 The Church of Santa María del Mar is one of Barcelona’s little gems. It was built in the 14th century with money contributed by merchants and tradesmen, and with the labor of the district‘s inhabitants. Given that all the funding and work came from the parishioners, it was decided that the church would belong solely to them. The church, built in Catalan Gothic style, is remarkable for its light and spacious interior. It has three aisles, with side chapels and an ambulatory. The side aisles are exactly half as wide as the central one and nearly as high as it, although they are slightly lower. This, combined with the wide arches and the slender columns that support them, makes the interior unusually light and spacious. All the columns are octagonal and the ceiling is made of simple ribbed vaults; the lack of ornamental features gives a sober look to the interior, strengthening the impression of spaciousness. The Cathedral de la Santa Creu y de Santa Eulàlia, Barcelona. The Catedral de la Santa Creu y de Santa Eulàlia (Cathedral of the Holy Cross and Saint Eulalia) is a Gothic church built between the end of the 13th century and the mid-15th century, with the exception of the façade, which, unfinished at the time, was constructed at the end of the 19th century. The building has got three aisles, with a transept, ambulatory and side chapels. 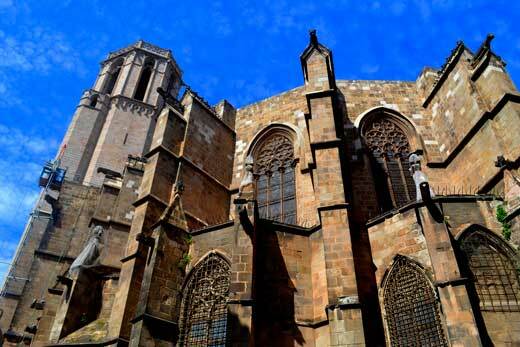 Like other churches in the city, it was built in Catalan Gothic style, remarkable for its open and spacious interiors. There is also a cloister with a 19th-century inner garden which creates a very particular atmosphere. Other highlights are the crypt, the choir, the sacristy, the royal tombs and the organ. A stroll through Barcelona’s old town is the best way of enjoying the town‘s history. 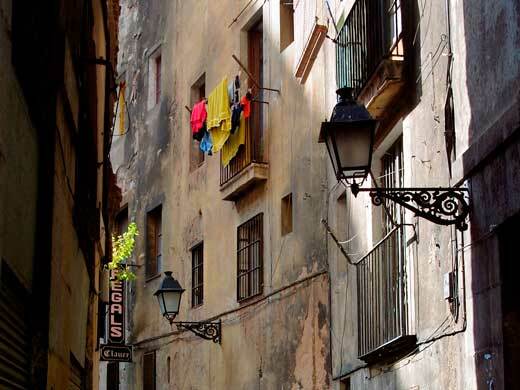 Walking down the narrow streets of Raval, Barri Gòtic and Born, the visitor will discover corners full of charm, as well as the many archeological remains and monuments that the passing of time has left in the city. It is possible to have a look at Barcelona‘s most distant past in the remains of the Roman city of Barcino, at its medieval history through its churches and palaces, and also at its modern history. Spanish version: 10 cosas que no te puedes perder en Barcelona. (*) Images: Daniel Stone, Börkur Sigurbjörnsson, Wojtek Gurak, Sugar, Andrea, Teresa Graus Ros, Melisa Delzio, Angela Llop, Peter Nijenhuis. Creative Commons License. Translation by Elena G. Barriuso.